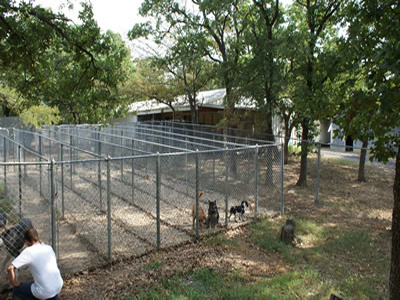 Kennel in the Oaks is nestled in a grove of oak trees on our family's land in beautiful southeast Cooke County Texas. When we purchased the land, we wondered what to do with the small office and abundant 6-foot chain-link fence pens which once housed an emu farm. As we prayed about this, we felt led to convert these resources into a dog boarding kennel! This family pursuit allows us to bring in extra income working together as a family, to teach our children the value of hard work, and to continue the flexibility of morning home education and afternoon/evening socialization activities. Our staff and family (plus our 2 rescued dogs!) would be honored to earn your family's trust in caring for your furry family members! 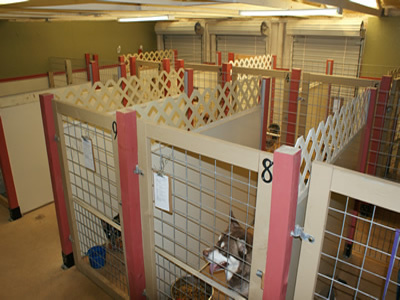 So call to schedule a visit to our Kennel in the Oaks! We desire to provide your pet with personal, loving care in a small, family environment. ​And we hope we will be a blessing to you as well!